This is the inner courtyard of the Palais Royal in Paris. The Palais Royal was originally built for Cardinal Richelieu between 1634 – 1639. It’s located in the 1. arrondissement of Paris, right opposite The Louvre. Today it is home to the Constitutional Council and the Ministry of Culture. 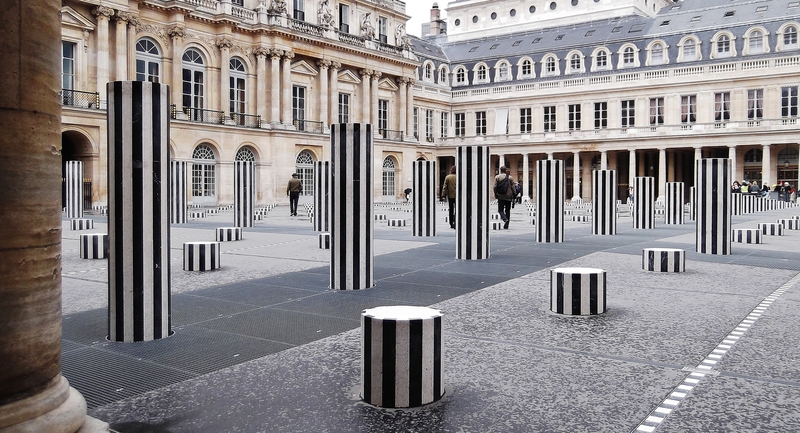 In 1986, the artist Daniel Buren set up his permanent installation “Les Deux Plateaux”. It is also referred to as “Les Colonnes de Buren”. The black and white lines of the pillars make an interesting contrast with the old building. Cool. I think that they should build one for Cardinal Guzman too!